The Emerald site, also known as the Emerald Acropolis, was an early Mississippian pilgrimage center key to Cahokia's development. 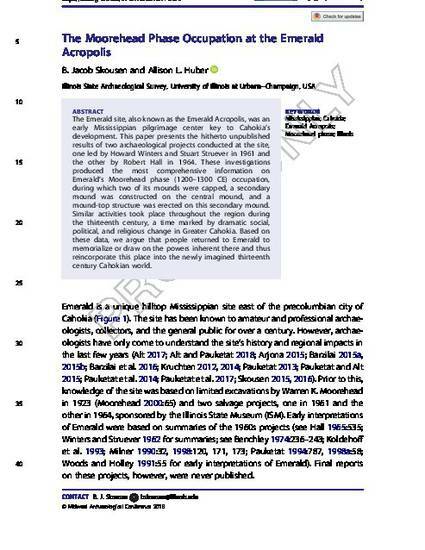 This paper presents the hitherto unpublished results of two archaeological projects conducted at the site, one led by Howard Winters and Stuart Struever in 1961 and the other by Robert Hall in 1964. These investigations produced the most comprehensive information on Emerald's Moorehead phase (1200-1300 CE) occupation during which two of its mounds were capped, a secondary mound was constructed on the central mound, and a mound-top structure was erected on this secondary mound. Similar activities took place throughout the region during thee thirteenth century, a time marked by dramatic social, political, and religious change in Greater Cahokia. Based on these data, we argue that people returned to Emerald to memorialize or draw on the powers inherent there and thus reincorporate this place into the newly imagined thirteenth century Cahokian world.